This is The Foundational Lie upon which The Lawyer Class has taken control of the American government and culture. ….But, as I say, those are the smaller issues. Let’s move on to the serious ones. A lot of Americans believe that the American “Founders” created a system that automatically fixes itself. They talk about the “balance of powers,” and think that it will always save them from a tyrant. The balanced powers of the US Constitution, however, were trashed within fifteen years and doubly-trashed just a century ago. In the Constitution, the states balanced the power of the national government (the one now in Washington, DC.) Not only did the states control half of the legislature, but they decided if and how they would implement the edicts of the national government. And that included deciding whether a law was constitutional or not. This changed in 1803 with the Marbury v. Madison ruling. This ruling – taught as a work of genius in American schools – was a fraud against the US Constitution. In it, the Supreme Court held that they understood the Constitution better than James Madison, the man who wrote it! 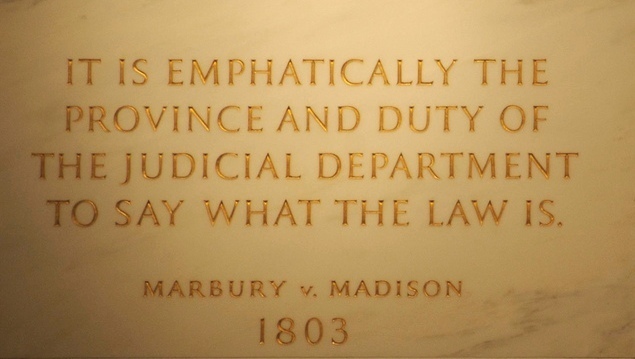 Marbury’s Judicial review (the Supremes ruling on constitutionality) merely involves one branch of the national government providing a check on the other branches of the national government. After Marbury, no one could check the national government. Washington DC was unleashed with Marbury v. Madison. What made it almighty was the 17th Amendment of 1913, which took the powers of the states and transferred them to Washington, by mandating the popular election of senators. With senators being elected directly by the populace, the states were cut-out of the equation. In their place, political parties gained massive power, and nearly all power was consolidated in the city of Washington. And so it is today. Washington is an unfettered beast. The system will NOT fix itself; the mechanisms to do that were lost a long time ago. Mr. Houraney is correct. How many more Americans need to suffer from this Oligarchy before enough will stand up and reinstate the original 13th Amendment in our Constitution of the United States, just as our original founding forefathers intended. Don't wait until you get it, what happened to me, . . . documented in the book Attorneys Above The Law by Dennis Schuelke – – because it THEN is too late. The lawyers are laughing all the way to the bank and you have been financially RAPED by this priviliged Oligarchy class of perverts who are actually criminal RICO operatives acting and posing as lawyers, attorneys, arbitrators, mediators, and judges. If you dont' think they have formed an immunity to prosecution, you better get this book and educate youselves!